Author: McQuillan, Karin Set In . . .
Karin McQuillan has written a brilliant first novel. I read Deadly Safari through in a sitting and loved it. I can't wait for her next. "Everything everyone can want--suspense, real people as characters, and real, untamed Africa out there in the darkness." I like the setting and the sound of your writing. You obviously know what you're doing." One of the best mystery novels I have read in a long time. It has everything--good plotting with pace and action, high-quality writing, good characterization and dialogue, and of course, the wonderful descriptions of wildlife. What more can I say? It is a page-turner to the end. "The jacket of Deadly Safari...contains so much fulsome praise from well-known writers that you know it can't possibly be that good. It is. McQuillan...keeps the suspense going for nearly 300 pages, teasing the reader into agreeing with safari company owner Jazz Jasper as she suspects each of her clients in turn...hard to put down...you will be halfway to booking your own safari...before the spell wears off." Reading the quotes from praising authors regarding Ms. McQuillans first novel is like paging through a list of who's who in the mystery genre. . . I haven't heard a discouraging word about this book. I was skeptical. It couldn't be THAT good, could it? Well, it IS that good! Try as I might to remain aloof, I was quickly drawn into the sensuous and exciting world of Jazz Jasper. The Kenyan wilderness comes alive...the characters engaging and the plot well developed...you (won't) be able to figure out whodunnit. This is a book I couldn’t put down, a story I didn’t want to end.” THE BEST MYSTERY OF 1993. A perceptive, realistic, dramatic mystery set in problematic present-day Kenya, this book is an excellent selection." "McQuillan's cast comments intriguingly, and often amusingly, on African culture as she conjures evocative scenes of dusty bush heat, elephants, lions and the wilder urban life of Majengo, a treacherous, teeming slum...colorful setting, fascinating insights into daily life in Kenya. The story is fast-paced and Jasper is charming and self-reliant. "Ambitious and captivating...a cleverly conceived murder. The author imbued her story not only with a depiction of living conditions but the soul and attitudes of another culture. The author's love of nature brings a special quality to her story. Her masterful handling of plot and characters is an added bonus." 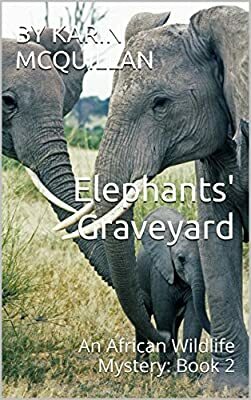 "No reader will be able to resist the storytelling magnificence of Elephants' Graveyard Karin McQuillan is a masterful writer, all the while enriching her complex plot with the insight and compassion of a caring soul." THE BEST MYSTERY OF 1993.